President Dianne F. Harrison saluted faculty and staff researchers at the third annual Principal Investigators Recognition Celebration on Oct. 23. About 150 principal investigators attended the event at the University House. Photo by David Hawkins. 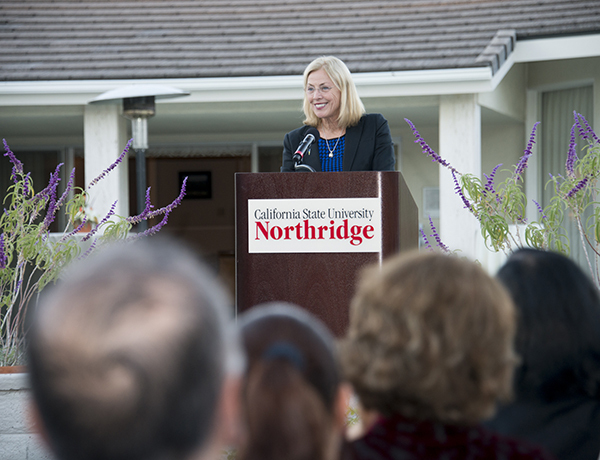 Encouraging faculty and staff to continue their efforts, CSUN President Dianne F. Harrison applauded those employees who raise millions of dollars for research at California State University, Northridge’s annual Principal Investigators Recognition Celebration on Oct. 23. Harrison hosted about 150 faculty and staff researchers at the University House: Each principal investigator (PI), the lead researcher on a funded project, was individually honored in recognition and appreciation for their dedication to projects that range from research on theater as an intervention for youth with autism to a study on lactation education. She lauded the efforts of the team recently awarded a $21.8 million grant, the largest single grant the university has ever received, from the National Institutes of Health to fund BUILD@CSUN, an aggressive effort to change the way traditionally underrepresented minority students are mentored and trained as they set off on a career path as biomedical researchers. Increasing CSUN’s research activity and sponsored programs is one of the president’s seven planning priorities. Since launching the first Principal Investigators Recognition Ceremony in 2012, Harrison said, research funding at CSUN has increased by 28.6 percent — 9.7 percent in the past year. She said this growth has allowed CSUN to pay students stipends totaling $3.4 million. Harry Hellenbrand, provost and vice president for academic affairs, also thanked and congratulated the researchers for their work. Department of Computer Science professor Ani Nahapetian, who received a $300,000 grant from the Association of American Colleges and Universities in support of “Learning to Code by Making Music: The Introduction of Computer Science Coursework with World Music Applications for the Retention of Underrepresented Students in STEM” — as well as a $50,000 grant from Intel Corporation in support of research on computer security — said she was honored to be recognized at the event. “It was also very inspiring to meet so many other faculty members involved in cutting-edge research on campus,” said Nahapetian, who attended the event for the first time this year. To read more about research at CSUN, visit our faculty and staff achievements webpage.